The size of the Morph Ball has never been explicitly stated. The original description of the Maru Mari described the item as “small and round like a ball” and no game since has ventured beyond this nebulous claim. In fact, the only frame of reference for Morph Ball size is the 1 meter given by scans in the Prime trilogy describing Ball-compatible tunnels, and this, unfortunately, has been misconstrued to mean that the Morph Ball itself has a diameter of 1 meter. This, of course, is ridiculous, as the Morph Ball would have to be less than a meter to boost through a one-meter tunnel with ease. Ruling this out altogether, there is one tool left to determine the actual diameter of the Morph Ball: pixel ratios. If one fixed height in a two-dimensional game is given, and that object is in the foreground, the approximate height of any other object in the foreground can be ascertained using the ratio of the number of pixels of both objects. 1. Take the mean of the five ranges. This produces a diameter of ~75.85 cm. 2. Create an optimized range of values in which the maximum number of games fits. If the diameter is given a range of 589/790 m (~74.56 cm) to 627/790 m (~79.37 cm), three games—Metroid II, Metroid Fusion, and Zero Mission—fit within, while a fourth, Metroid, sits just outside with its minimum of 551/690 m (~79.86 cm). A similar range of 551/690 m (~79.86 cm) to 57/70 m (~81.43 cm)—containing Metroid, Metroid II, and Zero Mission, with Metroid Fusion on the fringe—could be used, but the first is closer to the mean and by consequence closer to the outlier Super Metroid. Fortunately, both of these options correspond with each other, and though both leave Metroid and Super Metroid on the outside, they appeal to the two most recent Metroid games—Fusion and Zero—in which direction Nintendo will most likely move with its subsequent two-dimensional Metroid features. In short, the diameter of the Morph Ball is within a range of ~74.56 to ~79.37 cm, and on average is ~75.85 cm. I wonder if this could be expanded with the ratios of the 3D object in comparison with something in the game of known size. Like say the morphball and the morphball tunnel that was scanned at 1 Meter(in the chozo ruins I believe). ¿How does she fit, you ask? Keep in mind that it’s not only her, she’s fitting both herself, the armor, the bombs and Over One Hundred missiles in a ball whose external diameter is under 80cm. Since there’s no room for all that using just the usual way (cramming it all inside), there has to be either some additional system (matter-energy conversion, Clown Car space distortion) or perhaps just a mere Acceptable Break From Reality. Holy…well, I guess I can stop wondering now. I vote matter-energy conversion on this one, isn’t that also basically how the suit is stored/engaged anyways? On THAT note, how does she consciously control the morph ball? her inner mind gains control of the ball,if it was made by chozo its most likely controlled by her mind with mental power,along with help of energy from the suit,but the phzon suit could lead to problems,so it should never be used near a cliff,my theory also might explain why she doesnt vomit after rolling all over,and bombs is a burst of energy and can released by a burst of thought which could result in headaches,but the suit probably absorbs that pain. Thanks for this post. 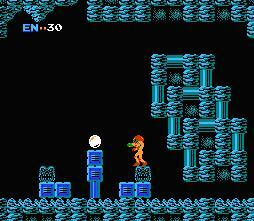 I have actually been thinking about this as I work on another metroid project. In the long run, it’s really doesn’t make much difference, but I was something I wanted to take into consideration as I did my work.